Discussion in 'Gear & Equipment Reviews' started by Meerkatsu, Jan 15, 2013. As the grappling apparel market matures, some manufacturers are seeking novel textiles and methods in order to differentiate their products from the others. US company WaMaDa have used bamboo-viscose fabric (cellulose from bamboo mixed with a small percentage of synthetic fibre) to produce the Genesis rank coloured rashguard. Bamboo is purported to offer superior sweat absorption and wicking effects and antimicrobial properties. It is also claimed to be a more ecologically friendly product, requiring less herbicides and pesticides to grow and farm. Wa MaDa sent me their long sleeve rashguard in size Small. The main unique selling point of the Genesis is the novel textile used. Bamboo viscose is made from bamboo plant parts that have been pulped and then treated to extract the cellulose - which is the hard stuff that make up all plant cells. Cellulose is both incredibly tough and structurally strong. It is then spun into a yarn and woven into textiles. It is claimed to offer great sweat absorption properties and is very comfortable. Read more about bamboo viscose here. When I wore the rashguard over several sessions, it did indeed feel incredibly soft and comfy. It actually felt more like wearing a thin, tight fitting woollen jumper, than it did a standard rashguard. Due to the very cold weather, I didn't get the chance to really sweat it out wearing the product. 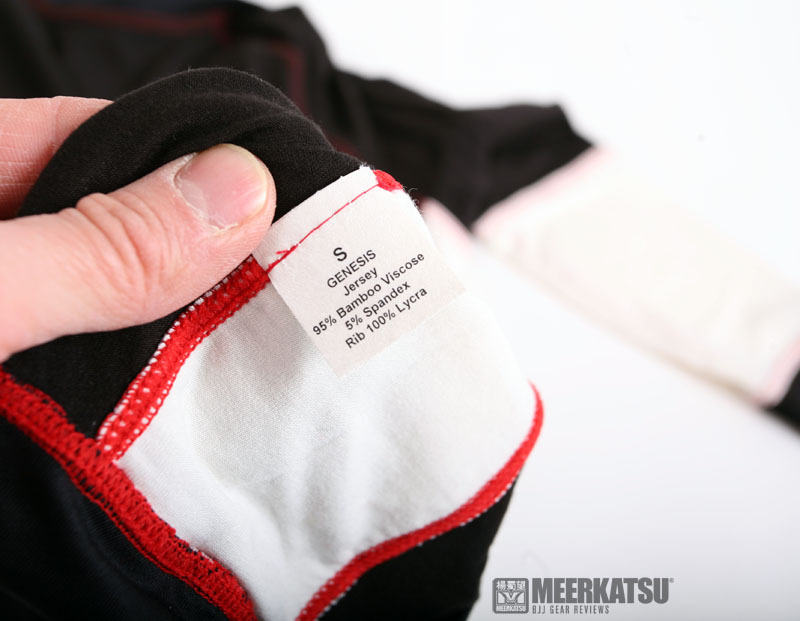 The brand owners own testimony suggests that it is much better at holding and wicking away sweat than standard rashguards, especuially in very hot and humid weather. He explained to me: " We were constantly getting frustrated during No Gi class because after 15 minutes of hard training the mats were too covered in sweat for effective grappling to continue. So we sought out a fabric that would retain more water and keep a high level of traction. Bamboo is also anti-fugal, anti-bacterial and anti-oder. " Graphics on the rashguard are screen printed directly onto the surface. I assume dye-sub printing, as found on polyspandex rashies, was not possible on bamboo viscose. The graphics are nice but I worry the screen printed ink used might fade, peel and crack over time. The bamboo textile panels are stitched together using what I can presume to be normal synthetic thread. Whatever this thread was made of I felt was a bit itchy on my skin. Especially on top of my shoulders. However I should note that I only wore this item as an under garment during gi class - so the weight of my gi ontop may have accounted for the extra itchiness. When I wore the rashguard without anything on top, I did not feel any abrasiveness. 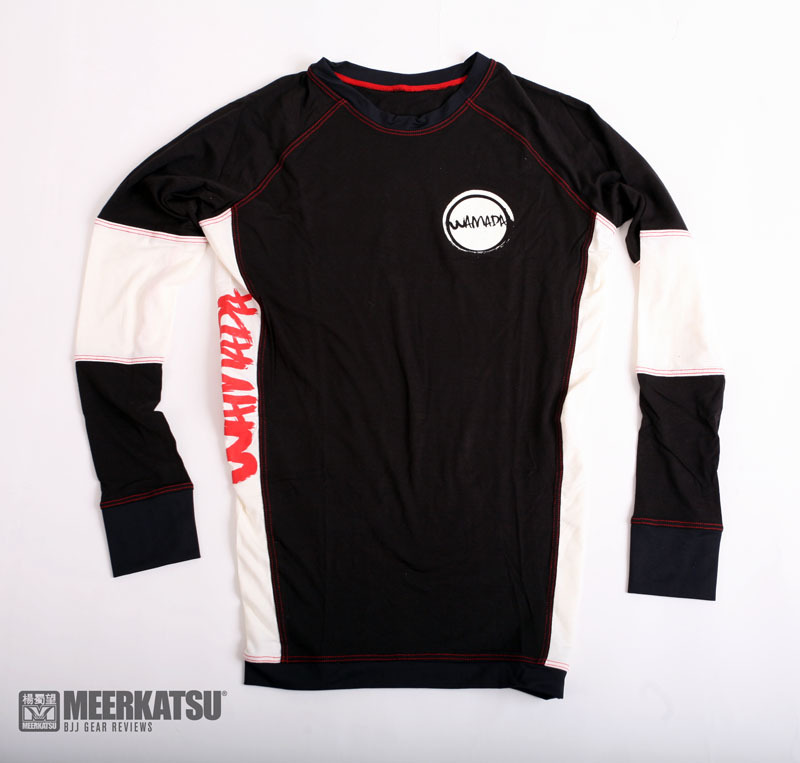 I mentioned this to WaMaDa who explained to me that this rashguard is really designed for nogi grappling. The best feature I liked about the Genesis was the very comfortable yet tight fit over my torso. It stretches over my body perfectly and I walked to class feeling like a Super Hero. Another interesting observation was that during cold weather - which we have been having recently - the fabric doesn't feel cold to the touch when you first put it on. This contrasts with standard lycra/spandex rashies which are freezing in cold weather! WaMaDa are offering novel new products on the market and for that I do applaud their bravery. At $60 a pop plus shipping, the price for this product is marginally more than most standard rashguards out on the market cost these days. However the clean simple design is actually used very well here and the sheer soft comfort factor of the fabric is a joy to wear. It's a shame that the stitch thread used in between panels is mildly abrasive (when worn under my gi, but not when used no gi) and I am also dubious of the claimed antimicrobial properties of the bamboo fabric. There is also some debate over the actual ecological friendliness of bamboo viscose - read here for an essay. Having said that, here is a product that is made in America designed by an American company. For my US readers, this may be an important factor to consider to them, especially in light of the recent movement to protect and grow local manufacturing and industry. I'm keen to see how WaMaDa grow their brand and if they continue their mission to make products in the USA. Know what it's missing is some meerkatsu artwork, (I know suckass LOL) It is kinda blah though.